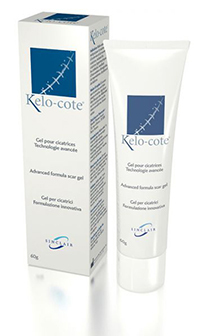 Kelo-Cote and Kelo-Stretch are two revolutionary products which can reduce the visible scarring of keloid scars and stretchmarks dramatically. With Kelo-Cote, you apply the size of a rice grain on the scarred area, and softly spread it over the scarred area. Kelo-Cote’s formula makes a thin protective layer over the applied area, and dries in minutes. It is fairly odorless, and is invisible, except for the light shine the protective layer leaves when in dries. Apply this cover twice daily, everyday for 3 months and you will be astounded at the results. It can be applied soon after surgery, to burns and thickened scars (keloids or hypertrophic scars). This product is only available at Registered Specialist Scar Management Centres. Both these products are 100% safe to use from the 4th month of pregnancy onwards and during breastfeeding. Please don’t hesitate to ask any questions regarding these two amazing products. They are only available at selected clinics, of which Ageless Cosmetics is one, and order your Kelo-Cote or Kelo-Stretch today!